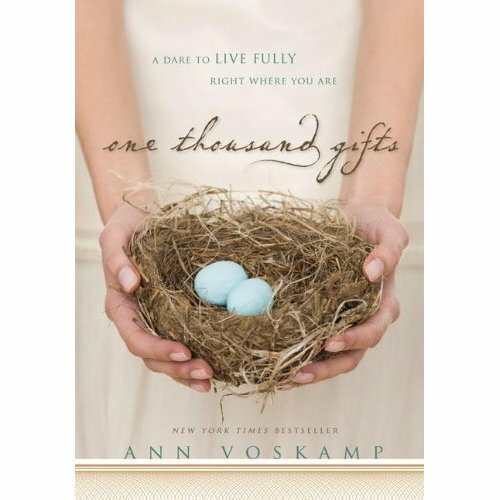 Many of us at Fellowship Bible Church have read or are reading ONE THOUSAND GIFTS by Ann Voskamp. Many of us who have read the book have begun gratitude journals of gifts from everyday life. Things like watching an elderly couple walk hand-in-hand through a store or hearing your children laughing together in another room. Or how about a bee buzzing on a spring flower or the feel of a warm shower after playing in the snow?Anything that is a special blessing from God in your everyday life. One mom even taped a large sheet of paper to her family room wall and had the whole family join in on creating a “Gratitude List”! HERE IS THE CHALLENGE TO YOU, THE MOMS OF FELLOWSHIP BIBLE CHURCH! We want to create our own ONE THOUSAND GIFT LIST right here on the Fellowship Mom blog!!! Share your gratitude list with us below and help us create ONE THOUSAND GIFTS FROM GOD FOR THE WOMEN OF FELLOWSHIP BIBLE CHURCH. 1. Watching a squirrel eat the sunflower seeds in our backyard. 2. The smell of my husband’s cologne on his shirts when I am doing laundry. 3. My children’s tiny wet footprints on the sidewalk when they get out of the pool. 4. My daughter’s wet open mouth kisses and the words, “You are the best, Mom”. 5. Sleepy eyed children waking up to hugs. 6. The morning sky is always changing. 7. Women crouched over their Bibles searching for treasures! 9. Mums on the front porch. 10. The smell of fall, and how it reminds me of the days I snuggled with my brand new babies. 11. The smell of brand new babies. 12. When my 3-year-old son says, “Mom, you’re so pretty!” while I’m still in my PJs. 13. Watching my boys eat apple sauce with chopsticks and seeing the smile on their faces. 14. Being known and loved despite my flaws. 21. The last two years getting to watch my dad care for my mom like she cared for him for over 60. 22. Having women of all ages in my life who are willing to walk this journey with me…no matter how crazy it gets.